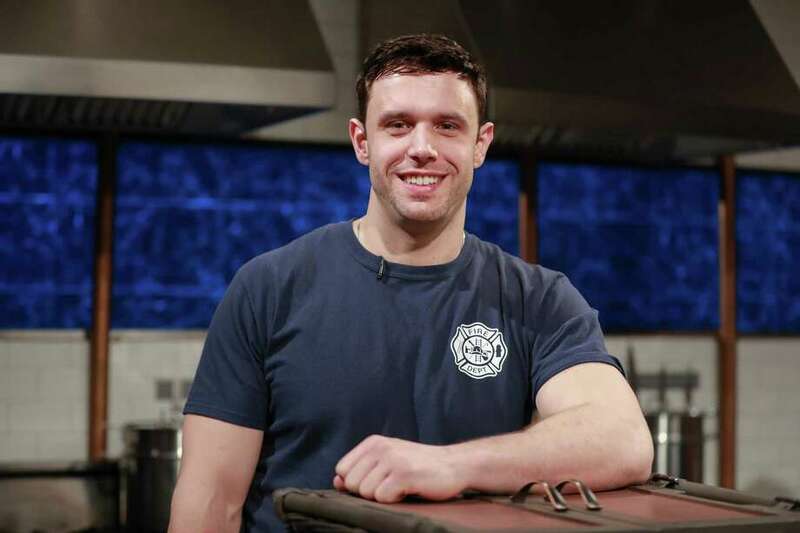 Congratulations to Daniel Brelsford, who is a Food Network “Chopped Champion.” The episode, called “Fire It Up,” featured firefighter chefs and cooks and aired last week. The following day, Brelsford’s cooking class at Consiglio’s Restaurant featured recipes using some of the mystery-basket ingredients required on the show. Background/Education: Worked with professional chefs and took a few courses for professional development at Gateway Community College. 1. What is the history of Consiglio’s? Trish Perrotti is the third generation running the restaurant. It was founded by her grandparents, Annunziata and Salvatore Consiglio, in 1938. It was originally called “Big Apple,” and was located across the street. 2. There are many Italian restaurants in New Haven. What sets you apart? Longevity and owned by the same family. 3. Tell me about the cooking classes and murder mystery dinners. The cooking classes feature recipes for many of our guests’ favorite dishes. The murder mystery dinners are interactive comedy shows that go on throughout the evening as guests enjoy a three-course meal. The cast mingles from table to table, dropping clues for a mystery that guests try to solve. 4. How long have you worked at the restaurant? Five years. 5. How would you describe the ambience of the restaurant? Casual with a beautiful outdoor garden patio. 6. What’s the most memorable meal you have ever eaten and where was it and who was there? The most memorable meal I ever ate was a few years ago on Christmas day. I smoked a turkey and we ate Christmas dinner as a family outside by the fire pit as it was such a warm day. 8. How did your interest in food and cooking begin? I was really born with an interest in cooking. I was so lucky that my parents were very supportive of me. I would run to the kitchen section of the department store starting at around age 5. Before my mother would report a missing child she learned to check the cooking aisles. I also very much enjoyed watching chefs, like then-young Emeril, with my grandmother. 9. In a nutshell, what is your philosophy on food and dining? You have to cater to your audience. Just like you have to use the right tool for the job, you have to create the right setting and cook the right food. Always act with your guest in mind. A chef that can do that while still being true to himself will be successful. 10. Where do you go to relax? I love to relax at home. I live on a beautiful river just about at the mouth of Long Island Sound. There is so much beautiful nature in my back yard. I will sit out with my dogs and just take in the beauty. Of course I have a smoker and grill out there, too. 11. What do you feel is the next big trend in dining? There are so many types of dining out there and so many trends that are really still in their infancy. Every year I am looking at food on a national scale being of better quality as something that is coming soon. People are becoming so educated on food. Be it fast-food using actual beef without 80 percent fillers or the local farms cutting out pesticides and antibiotics. I hope people will demand this and that more of my fellow chefs will understand that when food is grown better it tastes better. It is going to be move of a movement then a trend. 12. What did you have for dinner last night and did you cook it yourself? Beef pho. I didn’t cook it myself. 13. My cabinet has room for only three condiments or spices. What should they be? Salt, pepper, honey. 14. Surely you are inundated with compliments on your cooking. What’s the most memorable? I made agnolotti for my grandmother a few years back, she told me the pasta brought her back to the way she used to eat in Italy. 16. Imagine you had to prepare a meal for an old- school culinary master, like Escoffier. What would you prepare? I would cast iron roast a 24-ounce, bone-in ribeye with Bordelaise sauce and Dauphinoise potato. 17. Your favorite food as a child? Ravioli. 18. Which celebrity chef do you resemble most? I would have to say Robert Irvine. He has straightforward and flavorful food that is always geared to please his audience. He also has a great attitude and strong worth ethic. 19. Do you have any funny memories of learning to how cook? I was 14, my first year in a public school and a high school freshman. I got kicked out of intro to cooking on more than one occasion because the teacher thought I was asking outlandish questions to be funny. Looking back I can see why she thought that, but I was sincere. 20. What is your favorite ingredient? Butter. If you eliminate butter from a western world kitchen, you practically can’t cook. 21. What’s always in your refrigerator at home? Chicken thighs, they are so flavorful and economical. 22. What do you like for a quick meal out? An authentic taco or burrito. 23. What inspires you to get up and go to work every day? I love doing the ins and outs of my job. It’s easy to go to work. It is a hobby I get paid for. I hardly ever even think about the paycheck. 24. What would you do if you didn’t cook? I would be a fireman. Actually, I am. 25. Is there one compliment about your cooking that stands out as memorable? I made a French sauce for chef Ludo Lefebvre. He told me it reminded him of holidays home in France. I have always said that eating in a great ethnic restaurant is the cheapest plane ticket you can buy. 26. What’s something about you that someone might not know by looking at you? I run a foundation for drug addiction prevention, which includes a music festival as a part of our fundraising. Music is another passion of mine, and yes, the festival has great food. 27. At what point did you know you wanted to pursue a career in food? I knew I wanted to cook for a living when I learned I didn’t have to sit in college for four years to do so. 28. Who was your culinary mentor? I have worked for and with some fantastic chefs, but at 15, my neighbor gave me a job working for him at a takeout joint. He took the time to get me going and still supports what I do to this day. 29. Other than Italian cuisine what other cuisine do you enjoy cooking the most and why? I think French food is fantastic. French is to fine cooking as Shakespeare is to drama. 30. What is the biggest challenge in the restaurant business? Reliable staff. 31. What are your two favorite dishes on your menu now? Braciole, tortellini with pesto. 32. What changes do you foresee to keep the restaurant fresh and exciting? We are iconic for being traditional and historic to our roots. We stray away a bit from the traditional restaurant menu in our cooking classes, however, the dining room menu didn’t change much. When we serve something the same way for 80 years, why change at 81. 33. Where do you like to go for culinary travel? We are lucky to be an awesome food city here in New Haven and have NYC right down the train tracks. But I love going to Texas for that amazing barbecue. 34. What cooking tricks did your mother or other food mentor teach you? This isn’t a trick but more of a must. Stay ahead so you’re not rushing, and stay organized so you avoid distractions that lead to mistakes. 35. What dish or ingredient will we never see you eating? Intestine. 36. What is your guilty pleasure food? Chocolate anything. 37. What’s one must have at your last supper? Warm crusty bread with soft butter. 38. When you just want to prepare something simple, quick and delicious, what would you make? Quesadilla. 39. Rapid fire: Ketchup or mustard? Ketchup. Burger or hot dog? Burger. 40. Aside from Consiglio’s, what are some of your favorite dining spots in the area? Pantanal Brazilian Steakhouse buffet in Bridgeport and Heirloom in New Haven. 41. How would you describe the current dining scene in Greater New Haven? Competitive, there is so much great food in this area it’s basically saturated, which is good and bad. There are amazing restaurants that have closed the doors for good, but it also keeps everybody at the top of our game. 42. If you were giving a young person interested in a career like yours, some advice would be? Work in this field day in and day out for a while and see what the lifestyle is like. Most people quit because the lifestyle burns them out not because they don’t like to cook. 43. What first came to mind when you opened the basket containing the ingredients you needed to use (on the show)? I was familiar with ingredients and was thinking about how to use them in a creative way. 44. What were some things that surprised you on the set? How relaxed it was between the courses. There was lots of interaction with the host, judges and producers as compared with my other television experiences. 45. How many hours did it take to film the show? 15 hours. 46. What did you learn from being on the show? How important it is to have the time to refine what you are going to cook which isn’t the case during a timed competition. 47. What other food television shows have you appeared on? Six episodes of “The Taste.” Locally, segments on WTNH- CT Style and What’s Cooking on News 12 Connecticut. 48. Do you see yourself becoming a food television personality? It is a dream of mine, but I am realistic that there are very few spots that so many people want. I am lucky I have a career as a firefighter in addition to my passion for cooking. 49. For those who missed the episode, what were the ingredients you were required to use? Dessert: smoked chocolate chips, cherries jubilee, sriracha mayonnaise, mango. 50. Which recipe from the show will you be sharing with the readers? For the Jicama Salad recipe served with the wings visit https://bit.ly/2NtRHtu. In a food processor, place the puffs and process into powder, add flour, paprika, salt and pepper. Coat wings in the flour mixture and deep fry at 375 degrees for 12-15 minutes, until crispy and golden brown. Mix all of the hot sauce ingredients thoroughly with a whisk and toss with the cooked wings.